I developed this smoothie recipe back when Filter used to be in the Flatiron building. By spying on the counter folk, I saw that all they put in their smoothies was a banana, some frozen fruit, and a little bit of liquid; you used to have your choice between orange or apple juice. No dairy, which I always thought you had to have in a creamy-type drink. I didn't start making my own smoothies until this summer, until after I got this awesome Bella Cucina Rocket Blender Platinum Edition that Bellatrix recommended. There's something about this that works better than a blender. I have an antipathy to blenders, I know that's weird. I really dislike washing them. Also I don't think they blend smoothies very well, they always seem to leave a few frozen chunks of fruit behind. I think because of the upside-down design, everything blends more smoothly in a rocket blender. Then you unscrew the blade, and you drink right out of the cup. Less dishes, and everything's really easy to wash and doesn't pile up in the sink. Totally worth it to get the one that has the two cups, too. For best results, put the frozen fruit in the cup first—two-thirds of the cup is a good amount. Break up a banana and put that on top, and pour in enough water to cover the frozen fruit. Coconut water has been a little hard to come by and I need it more for my workout drinks, so I've been using just water in my smoothies and it's fine. Add flaxseed and flaxseed oil, if desired. I use milled flaxseed, which can go right in there. If you have whole flaxseed, you probably want to grind it first in a coffee grinder. Screw on the cap, and stick the cup on the motor base; so now the soft banana is on the bottom, which helps get your smoothie going versus having the frozen fruit jamming it up. Blend for 30 seconds, then take it off the base and give it a little shake to get anything that's stuck on the top of the cup. 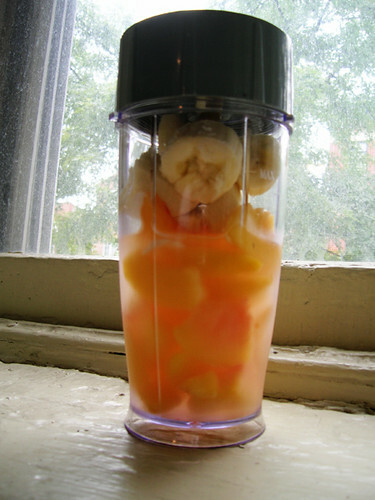 Blend for another 20 seconds or until the smoothie is churning freely from top to bottom.